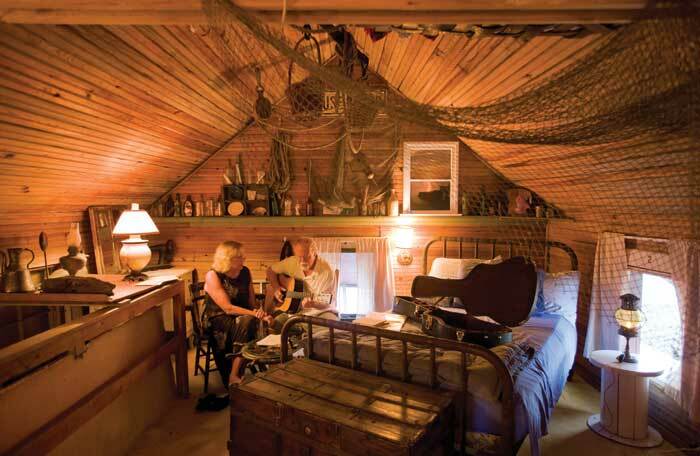 For 40 years, the Nags Head cottage has beckoned the Stinson family home. 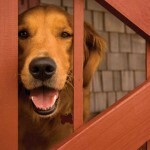 Billy and Sandra Stinson’s golden retriever, Samba, races to the edge of the deck, stands there for a second, then dives. She sails through the air, legs outstretched, until her belly touches the water, ripples fanning across the surface to the shoreline. 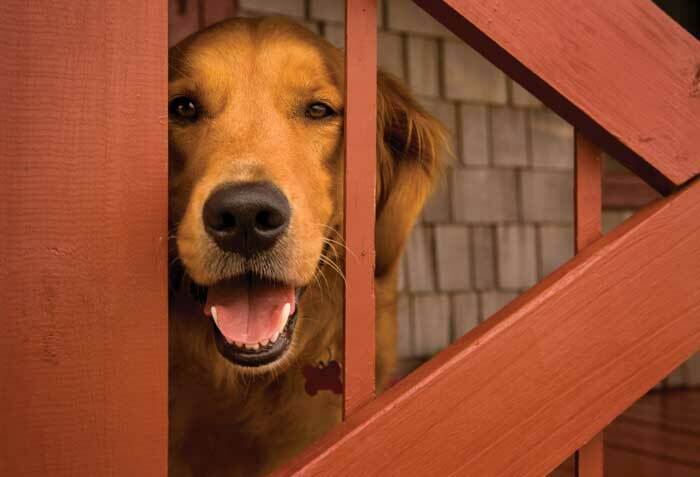 Letting the dog out of the car is the first thing Billy and Sandra do when they arrive at their Old Nags Head retreat. The land beneath Stinson’s Ranch has long been swallowed up by water. 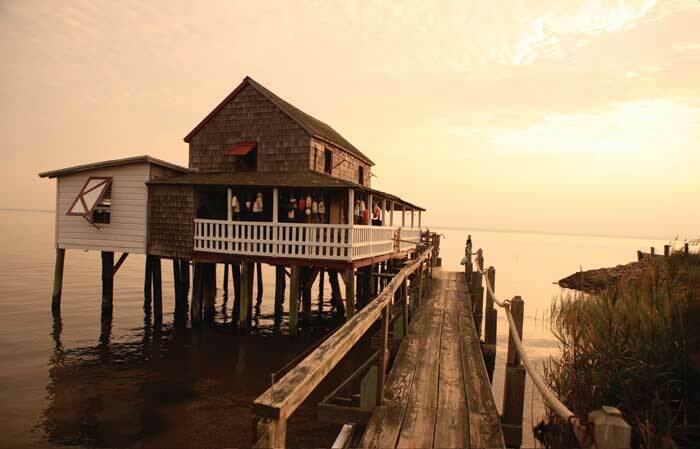 The cottage, perched on pilings, rises from Roanoke Sound. 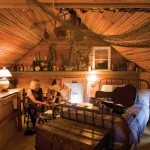 The Stinsons, who keep a permanent home in Greenville, have been making this journey to the Outer Banks for more than 40 years. Since 1963, in fact, when Billy’s family bought the house. Billy courted Sandra here. The couple rendezvoused here, vacationed here, and raised their daughters here. They said farewell to loved ones here and welcomed a son-in-law into the family here. Over the decades, days at Stinson’s Ranch turned into weekends, stretched into weeks and, now, months at a time. For Billy, Sandra, their family, and friends, everything they need, whatever the weather, is waiting inside this cottage. 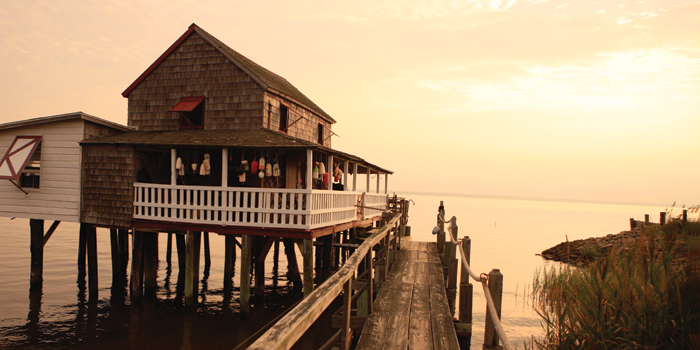 EDITOR’S NOTE: As Hurricane Irene battered the North Carolina coast on August 27, 2011, homes along the Outer Banks were particularly vulnerable. We were saddened to learn that Stinson’s Ranch did not withstand the hurricane as it came ashore. Stinson’s Ranch was a unique symbol of life along our coast. Its story is one of family and friendship, anchored in a place where land meets ocean. Below are some images taken by photographer Jimmy Williams that accompanied the Our State story in May 2010. Scroll down to see reader comments on the loss of Stinson’s Ranch. Because there’s no end to Billy Stinson’s creativity, amusements decorate the outside and indoors, in obvious places and in the tiniest of details. Lifting the sash on a kitchen window, Billy slides the round edge of a butter knife between the window’s frame and the sill to hold it in place. In the upstairs loft, Billy raises the windows and props up the wooden storm shutters with oar handles. Once the cottage is open, from every window and every doorway, it’s possible to see and hear the water. 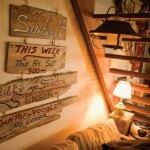 Furnished with a hand-me-down sofa and chair, the living room is decorated with a collection of found objects, like the welcome sign from an old tavern displayed near a shipwreck map of the North Carolina coastline. Billy retreats to the cottage as often as possible, never retiring from the creative process and always encouraging those around him to do the same. Many visitors have expressed themselves in writing, filling seven volumes of hardbound artist sketchbooks, in which family members and guests have shared memories made at Stinson’s Ranch. Some decorative items have washed ashore in high tides and storms, only to be reclaimed by Billy. The logs fill a book rack that he fashioned from a piece of old sand fence. The book rack hangs on the open stair case. Above the book rack is a sign, with the word “Loft” burnished into the wooden lid of a round bushel basket. Each of these artifacts has a story to tell. 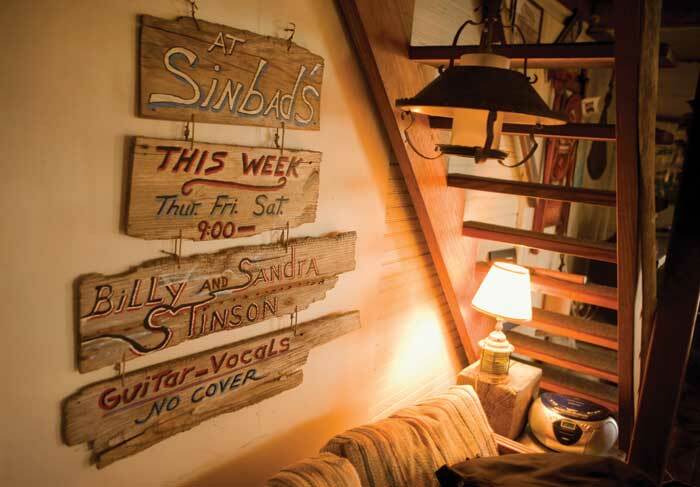 Among them are two prized possessions: a banjo and a guitar that accompany Billy and Sandra. They share a passion for singing. There was, he says, no electricity or any chemistry at the time. Sandra just enjoyed the music. It was during the early 1960s, Billy says, when folk music was exploding. “It was safe then,” Sandra says, laughing. They rendezvoused at Stinson’s Ranch. Together they strolled the soundside and hiked into Nags Head Woods, where Billy carved their initials into a maple tree: BS (Billy Stinson) LVS SM (Sandra Matlock) surrounded by a heart, crowned with the date: 9/1/66. In an old family photo, they pose beside the tree, Billy sporting his strawberry blonde bowl cut and wearing a hooded oilskin coat. His face is framed with thick black Wayfarer glasses. Sandra wears black gloves and a red wool plaid coat with brass buttons, her long blonde hair pulled into pigtails. “Well, we were kids in ’66,” Sandra says, laughing. They married while Billy was in the Army later that same year. 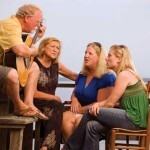 Billy and Sandra’s daughters, Erin and Amanda, have shared the love of singing with their parents. At Christmastime, they sing together in church. For fun, Billy and Sandra host a weekly music show, “Folk Seen,” a 30-minute production that Billy videotapes, broadcast at 5:30 p.m. on Greenville Public Access Television’s channel 23. Frequently, Stinson’s Ranch is a backdrop for the show, and proceeds from CDs that they record are reinvested into caring for the cottage. “We used to rent it and put that money into the upkeep of the cottage,” Billy says. That level of stewardship has not always been uppermost in Billy’s mind because he was only in high school when his parents bought the cottage. With no tradition of summering in Nags Head, the purchase was pure whimsy. Billy says his folks did not have a lot of beach savvy. For more than 40 years, the house has been held together with a reverence for history, the love of a special place, and the spirit of kinship that has survived the ages. About 15 years ago, Billy’s brother left the cottage, and when he closed the door, he didn’t lock it. The storm blew open the door, and waves flooded the house with two inches of water carrying debris. “All of this was sea grass flume — broken grass, broken sea oats that float on the top of the water,” Billy says, sweeping his arms from one end of the room to the other. They shoveled the sand and flume out of the house to find only minor damage, a few buckled floorboards. “That’s actually the kind of thing that caused all the other cottages to go down,” he says. 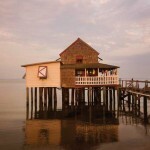 They have photos of the cottage during other storms: in 1999 during Hurricane Floyd, when it was swamped with white-capped waves; and during a nor’easter, when the wind sucked the water out of the sound and the cottage towered above the mud flats. In another photo, circa 1953, the cottage is shown on higher ground with another cottage beside it, to the west. A tornado came through later, and that neighboring cottage is no more. Another force threatened the cottage in 1995 when Billy’s brother, Lynn, had fallen on hard times and the house went up for auction. But Billy and Sandra saved it, and since then, they have done everything within reason to hold on to the place they hold so dear. That includes allowing the house to be photographed for travel brochures and opening the cottage for historic house tours that help preserve the identity of Old Nags Head. In 2006, Stinson’s Ranch was listed on the National Register of Historic Places as the Markham-Albertson-Stinson Cottage, so named for the families who have owned it the longest. A paper trail dates the house back to 1903. Billy has the time now to ponder such things and visits the cottage at all times of year, including the winter. On one of those winter days, he set out to find the tree. Finding the tree after all of those years inspired him to create a special gift for Sandra. Billy assembled it from hand-cut paper that he hand-painted himself, and he embellished it with handwritten verses that tell the story of their lives. 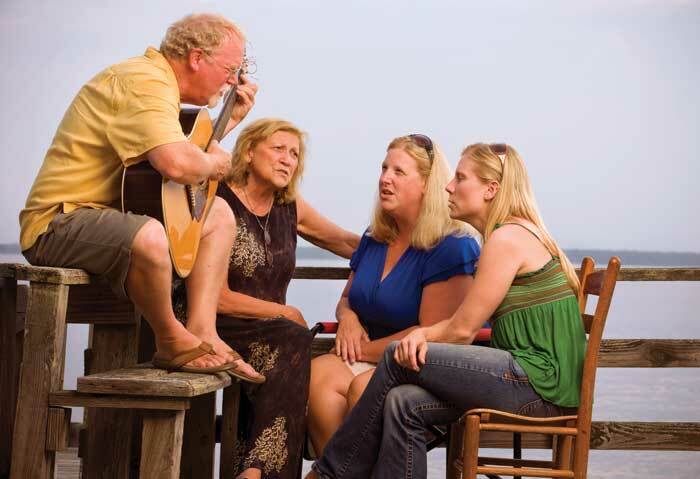 Many of those days were spent in Nags Head with their daughters Erin and Amanda. From the time they were little, Erin says, they invited their friends to come and stay with them. They bunked upstairs, in one open room, furnished with iron beds and antique bureaus that came with the house when her grandparents bought it. “When I was younger I thought everybody had a place like this,” Erin says. “One summer,” Sandra says, “they had a place under the deck that they had to lay down to crawl into … only about a foot-and-a-half tall.” The girls and their friends spent hours down there. Amanda was a tomboy who built forts out of overturned porch furniture covered in bed sheets. Last year, the cottage was the obvious location for her wedding celebration in October. 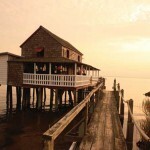 She held her bridesmaid’s breakfast on the porch, and, following the wedding ceremony on the Manteo waterfront, she and her husband, Hayes, used the family skimmer as their getaway boat, the same putt-around boat that Billy and Sandra use to run from Nags Head to Manteo for coffee, or lunch, and the entire family uses for flounder gigging or for pulling trout, bluefish, and croaker out of the sound. 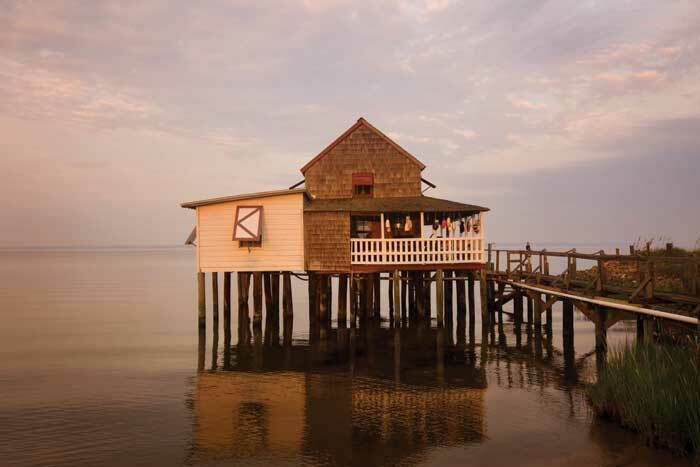 Whether they come to loll inside the inner tube tethered to the dock by a slack line, to revel in crossing the sound in the skimmer, or to swing in a hammock strung between the pilings beneath the cottage, people are always arriving or departing. More often than not, Billy is the architect of the fun and games. The New Year’s Eve tradition is rooted in spending the day thinking about what each person would like to change in the coming year. They write their regrets on a piece of paper, fold it up and put it in a plastic boat. They take the boat to the end of the pier, set fire to it, and let it drift away. “For a long, long time,” Sandra says. Marimar McNaughton is the managing editor of Lumina News and homes editor of Wrightsville Beach magazine.